Life like soft animate action like soft bait, and also hard existence power to push water as hard bait, inherit those two dominant DNA, ultimate evolution of jointed baits and genetic mutation plug 「JAVALLON HARD」. 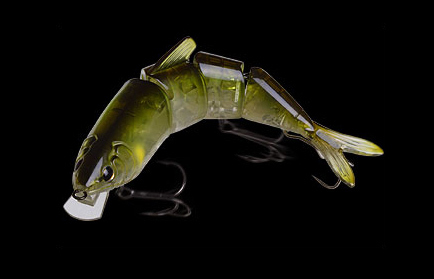 Since released, JAVALLON series has shown incredible ability of catching big fish and make it standard of swim baits. High performance of snug less and full body driving action gives big impact for bass fishing scene. But there was some weakness of JAVALLON. Low appear for calling fish in open water because of soft material, also relative to snug less but hard to make good hook set due to single hook. If we can keep one and only natural action and also strong fish calling as hard bait in open water or in current …. If we can catch the bass in low active condition…. Distress makes us to produce JAVALLON HARD to next step for jointed big bait.